A. The "Holy Place": Priests went into the Holy place each day. There were three articles of furniture in the Holy Place: a candlestick, an altar of incense and a table with twelve cakes of bread. This area of the sanctuary symbolized how God changes us and makes us (in our characters) like Him. 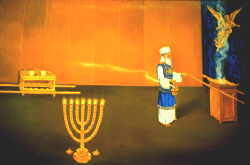 The golden candlestick (that burned all the time) showed how the Holy Spirit is to come and live in us and give us power over sin and to make us lights for Him. The "altar of incense" (that burned all day) showed how Jesus intercedes (prays for us) every day in Heaven as we pray for ourselves. The special table with twelve cakes of bread (made without yeast), symbolized the life that Jesus lived for us. We can have that life in us as we "eat" His words through studying the Bible. Slowly, the Holy Spirit re-programs our minds (our mental computer program) and we become more and more filled with Jesus love. We live more and more like Jesus. Who is safe to save, and take out of this world of sin? Who loves and trusts God enough to love and obey Him for all time? Before Jesus comes, the Universe must be able to see that God is fair in only saving the people who chose to love and serve Him. 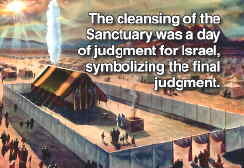 This sanctuary or temple was made of cloth and animal skins that could be carried with Israel as they moved from place to place. Later, in the time of King David and King Solomon, a large new temple was built that was made of stone. 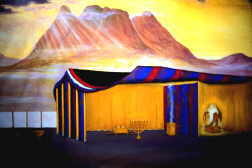 God helped Israel prepare a special place to worship him. 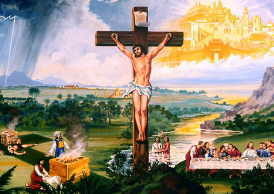 [Exodus 25:8] God gave Israel many symbols and sacrifices to help in understanding the plan of salvation. But, Israel kept on forgetting to obey and worship God. Israel liked to "do their own thing!" Go to the Next Section: God's People Compromise With The World.